Woman’s Essence Magazine is an an online magazine that aims to combine quality educational information in a fun way, writing on subjects [women] care about. 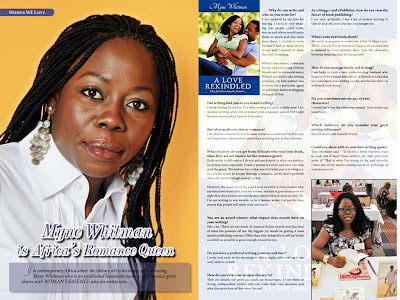 In a new segment, Women who love to Write, they featured me in an interview titled, "Myne Whitman is Africa’s Romance Queen"
In contemporary Africa where the literary art community is beginning to embrace various genres, established romance Author, Myne Whitman, whose books include “A Heart to Mend” and “A Love Rekindled”, and real name, Nkem Akinsoto, shares with WOMAN’S ESSENCE why she writes love. Why do you write and who do you write for? I was inspired by my love for reading. I found it very amazing that people could create stories and others would enjoy them so much and also learn from them. 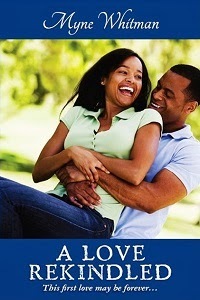 I started to write because I had so many stories in me and I wanted to share that love of reading. When I first started, it was just for me, and something I felt my friends and family would enjoy. When I decided to take writing seriously, my first instinct was to write for a particular agent or publisher, however blogging changed all that.